Shark Defenders got in a few dives with Mike Neumann at Beqa Adventure Divers in Pacific Harbour, Fiji last week. 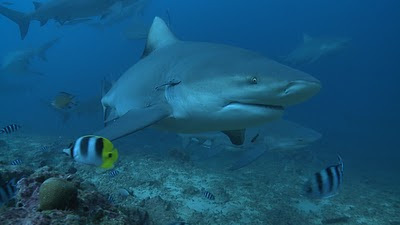 Coming face to face with 3-meter bull sharks is something every diver should aspire to do some day. The bull sharks hang out at the "arena" at about 100 feet, where Mike's able staff feed the sharks yellowfin tuna heads discarded from the local fishing fleet. The sharks are trained to come in from the left, then they swim around for another round. There were probably about 50 bull sharks on our first dive. After about 17 minutes at depth we floated up towards the reef and saw grey reef sharks and blacktip reef sharks. 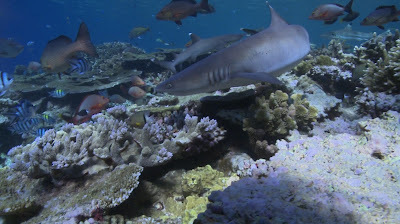 During our decompression stop it was blacktip reef sharks and whitetip reef sharks. 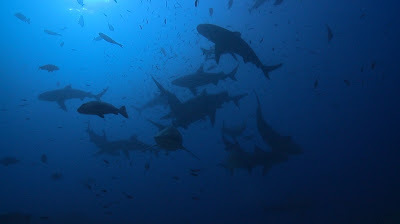 Our second dive was all bull sharks, with a spattering of giant trevallies for good measure. A big thanks to Mike and the BAD team for an exhilarating, yet safe, dive. The Guam Senate will vote on Thursday to pass Bill No. 44-31 to ban the possession, sale, and distribution of shark and shark parts. Since the bill was introduced late last month, over 14,500 people around the world have signed a petition and 330 supporters from 57 different countries have written unique letters. 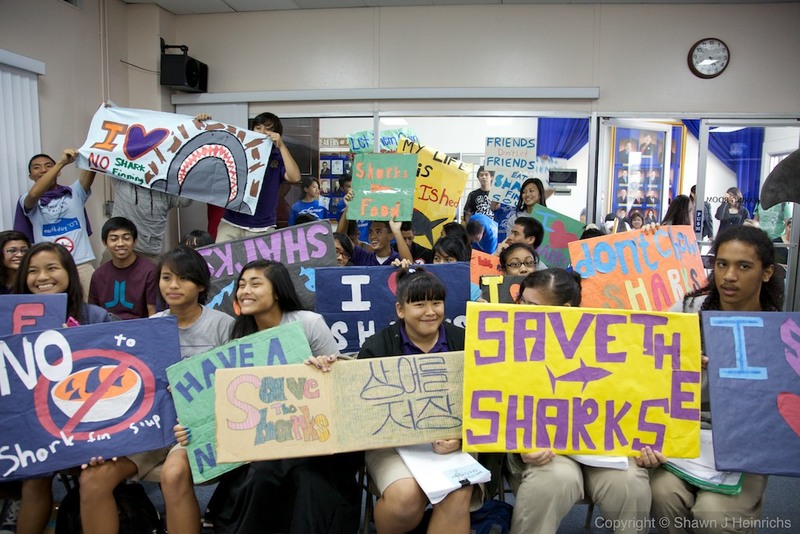 Additionally, local Guam students have submitted thousands of signatures and hundreds of letters as part of their Shark Tsunami campaign. 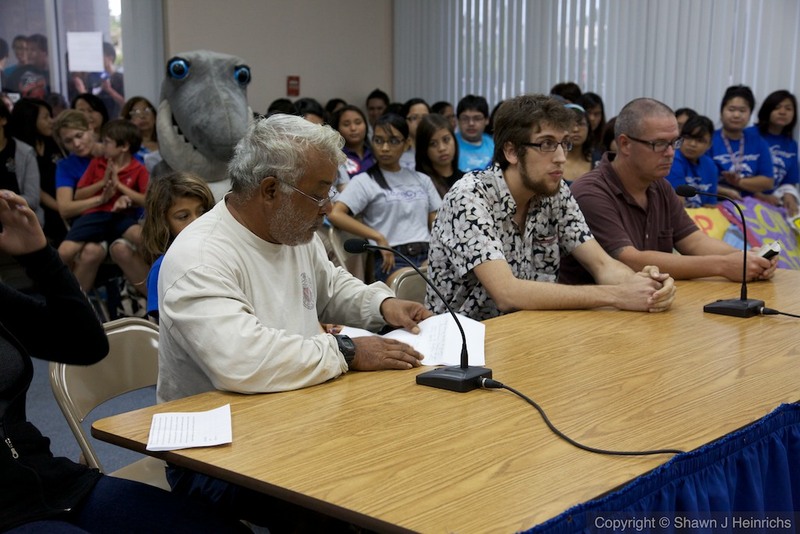 The President of Guam Saltwater Anglers, Tom Camacho, is quoted as saying: "We have been working diligently with Senator Rory Respicio and his staff to see to it that this Bill is favorable to everyone concerned. We feel that the intent and actions of this Bill protects Guam's unique traditions and culture and addresses the activity of shark finning by taking a stance to prohibit such activity. We greatly appreciate all the efforts and resources that Senator Respicio and his Committee provided and we believe, through collaboration, exchange of ideas, communication, patience and understanding, that we have worked towards a resolution for the protection of fishing as a tradition and culture as well as the prohibition of shark finning." This Valentine's Day, why not show your love for sharks in Washinghton State? Last week legislation was introduced in the Washington State legislation that is similar to the recent shark fin bans passed in Hawaii and Northern Mariana Islands and pending in Guam. Senator Kevin Ranker, author of the legislation and chairman of the Natural Resources Committee, will host a public hearing on SB 5688 this coming Monday on February 14, 1:30pm PST in the Natural Committee Resources Hearing Room (Rm 2 J.A. Cherberg Building Olympia, WA). 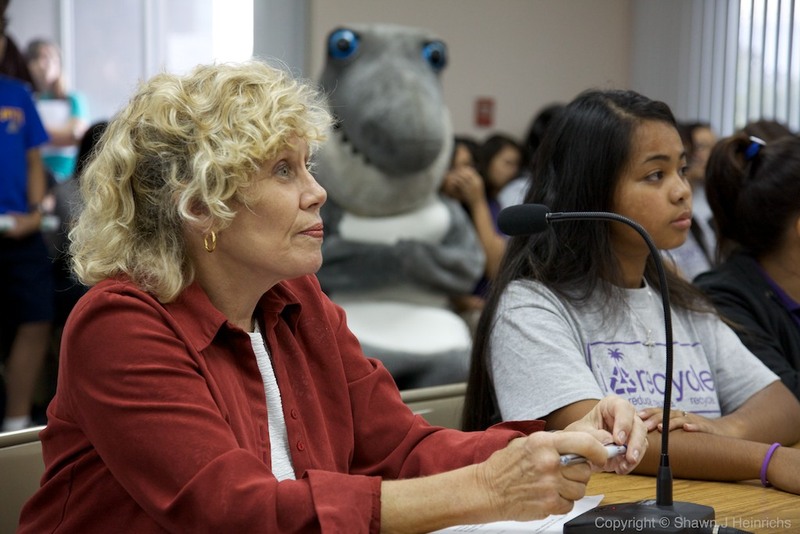 We need your help to provide testimony in support of this latest shark fin ban! It does not matter where you live, the shark fin trade is a global problem and it effects shark populations worldwide. Our effort for gathering testimony in Guam resulted in 370 unique letters from 56 different countries. 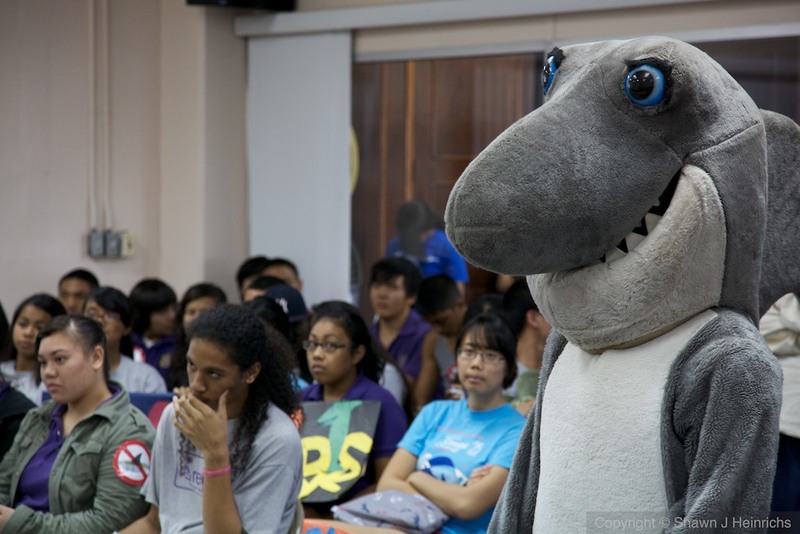 SHARKS STILL NEED YOU TO SUBMIT WRITTEN TESTIMONY ON THEIR BEHALF! Testimony should be addressed to Senator Kevin Ranker, chairman of the Natural Resources and Marine Waters committee. And it should be sent to ALL committee members. Please also cc your testimony to the committee staffer Curt Gavigan: Gavigan.Curt@leg.wa.gov and Iris Ho of Human Society International: iho@hsi.org. This will allow Shark Defenders' partner organization HSI to track the testimonies in case the committee has any follow-up questions. Thank you so much for your support! 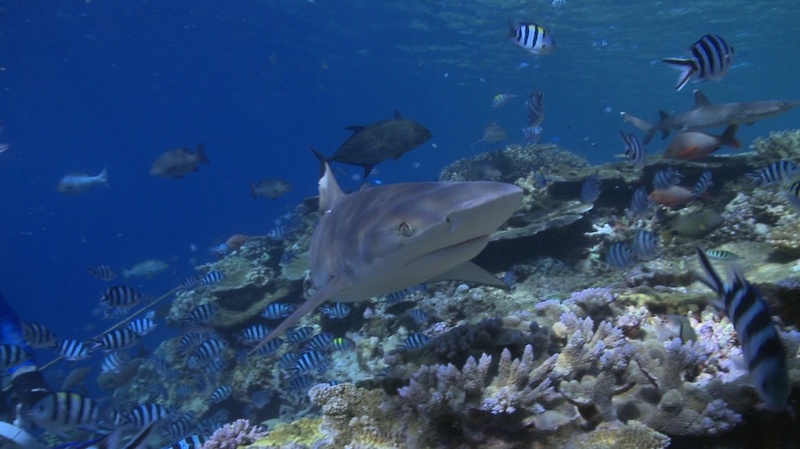 With similar legislation in the California and Oregon state legislatures -- not to mention Guam and the Philippines -- we are developing serious shark protections across the entire Pacific! The text of SB 5688 can be seen here. We really need to ensure the successful passage of Bill 44 and take a bite out of the ridiculous argument that live sharks are not a valuable asset to Guam. Or that fishing for sharks is some form of tradition on Guam or in the balance of the Pacific. In reality, in many instances, sharks are revered and respected. First, live sharks are an extremely valuable asset to Guam and the balance of the Pacific island economies. To some extent, sharks are the equivalent of an underwater gold mine. Tourists visit areas to see things they cannot see at home. They come to Guam for sun, sea and sand. But they can find that in many other places too. So that is not really a special asset. On the other hand, if our tourists visited Guam to see sharks, turtles and beautiful coral reefs, it would generate far more money for our tourism economy. Second, the importance of sharks in our ocean ecosystem, coupled with the fact that they are endangered, should be a vital concern to us all. Sharks are not only natural predators, they are critical partners, cleaning and balancing agents in our surrounding waters. Third, the value of supporting testimony shows that Bill 44 is not only local, but global, with nearly 11,000 testimonies and 14,298 online signatures respectively. Fourth, Bill 44 does not call local fisherman evil or make it look like they are the ones killing sharks. While catching a shark may happen accidentally from time to time, this bill is really designed to prevent anyone and everyone from intentionally killing sharks and rays for the purpose of commercial sale of their body parts. In particular, fins. Having lived and fished here for more than 40 years, I have no conscious recollection of anyone I ever knew going out to fish specifically for sharks. In reality, as good stewards of our environment, fishermen, the Department of Agriculture's Division of Aquatic and Wildlife Resources, the National Oceanic and Atmospheric Administration, the University of Guam's Marine Lab, administration and Legislature must work together to sustain our ocean environment for generations to come. Fifth, and more importantly, Bill 44 protects us within our jurisdictional waters. I have been a scuba diver for more than 38 years. I like to see and interact with large sealife, in particular, sharks. According to Oceana.org, "scuba divers are valuable participants in ecotourism and provide coastal areas with economic incentives to protect and preserve local marine wildlife and habitats. ... Divers often enjoy a deeper understanding and willingness to protect the oceans because they have experienced them firsthand." Maybe more of our political officials should become certified divers! "Divers contribute to local economies by paying to dive and vacationing in areas near dive sites," the Oceana notes. "As a group, scuba divers take an estimated 1.7 million dive vacations each year at an average cost of $2,424 per trip, thus spending more than $4.1 billion dollars in dive-related vacations annually" worldwide. "Healthy marine ecosystems are of great value to divers around the world. In fact, most scuba divers are willing to pay more for a chance to see healthy ocean wildlife, such as sharks, sea turtles and healthy coral reefs," Oceana says. "This proves that there is an economic incentive for protecting ocean resources, for the economies of both coastal and non-coastal communities. Unfortunately, our oceans face serious threats and urgently need increased protections. Divers and others who value healthy oceans need to speak up on the oceans' behalf." "Quantifying this value is important, in part, because it provides economic justification for the protection of marine wildlife. Oceana conducted a study, in collaboration with Duke University, to assess the value of seeing healthy corals, sea turtles and sharks to divers. To assess this economic value, scuba divers were asked the maximum amount of money they were willing to pay, in addition to their normal dive costs, for an increased likelihood of seeing a particular species." According to ocean costal management studies, divers are willing to pay to see turtles at the rate of $29.63 per dive, sharks at the rate of $35.36 per dive and healthy coral reefs are the rate of $55.35 per dive. Annualized, this translates into a total annual value of $ 177.8 million, $212.2 million and $332.1 million respectively for divers worldwide. In addition, the survey examined the divers' views on their role in marine conservation. Information was obtained from 504 scuba divers from across the United States, who responded to a 25 question, web-based survey. "Of the 467 respondents willing to pay more to see healthy reefs, nearly three-quarters viewed coral reefs as an essential component of the marine ecosystem," Oceana says. "The most common reason given by divers that were not willing to pay to protect coral reefs was that they could not afford to donate (90.5 percent), indicating they still believe reef conservation is important." It seems fairly simple: shark, turtle and coral reef protection not only makes good ecological sense, it can also serve to grow economies and leave the oceans natural beauty in place for posterity. 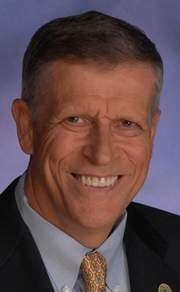 Lee P. Webber is a former president and publisher of the Pacific Daily News, and has been a resident of Guam since 1968. Last year might have marked more than a turnaround for the global economy. It also may prove to have been a watershed for protecting some of the oldest species of fish in our oceans. Slowly, we're beginning to realize that some shark species could be facing commercial extinction due to unsustainable fishing practices. Last year the United States, the Maldives and several other countries took important steps to help protect dwindling shark populations. But to ensure the long-term future for these magnificent animals, additional work is needed. There are more than 400 species of sharks swimming in our oceans. Sharks are also some of the oldest large animals in the sea, with an evolutionary history that can be traced to before the age of the dinosaurs. Today they serve as vital apex predators, helping maintain balance in the marine ecosystem by removing excess or diseased fish. These charismatic marine predators play another useful role: as economic engines for communities that cater to divers and others seeking wildlife-related recreational activities. Worldwide, tourism generated by whale sharks-the largest species of fish on the planet-is estimated to total more than $47.5 million per year. The Bahamas Dive Association has stated that shark-related tourism contributed up to $800 million to its national economy over the last 20 years. 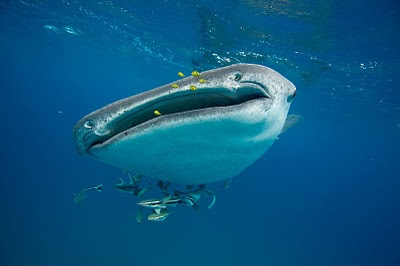 Sharks, however, are also prized for their fins-a key ingredient in an increasingly popular Asian soup. Once considered an exotic delicacy, shark-fin soup consumption has soared over the past decade. Indeed, a UN study found that fin imports to Hong Kong and Taiwan alone rose 214 percent from 1985 to 1999-a situation due in part to the combination of a large, growing population and the explosion of wealth across Asia. This, together with weak to non-existent rules governing shark catches and international trade, has set the stage for massive overfishing. Up to 73 million sharks are killed each year, primarily to support the global fin trade. Leading marine researchers now warn that 30 percent of the world's shark species are threatened or near threatened with extinction. Some populations, such as scalloped hammerheads and dusky sharks along the eastern U.S. coast, have plummeted by up to 80 percent since the 1970s. Against this background, 2010 proved an important year for ocean conservation, with both ups and downs. In March, the international community chose commerce over conservation by rejecting protection for an array of marine species at the meeting of the Conference of the Parties to the Convention on International Trade in Endangered Species. This was a hard blow to conservation efforts for a number of threatened animals, including several types of sharks. Yet while the year had a rocky start, it also saw a number of solid steps forward. Last spring, the Maldives stepped up in the struggle to protect the health of our oceans by creating a sanctuary for sharks in its waters. Roughly an area the size of Portugal, the newly created sanctuary covers 35,000 square miles of the Indian Ocean. This was followed by adoption of protective measures for eight shark species at the November meeting of the International Commission for the Conservation of Atlantic Tunas. In late 2010, the presidents of Honduras and Palau challenged other world leaders at the United Nations to join them in working to ensure healthy global shark populations by establishing additional sanctuaries and ending the practice of "finning," or the slicing off of a shark's fins only to discard the animal, leaving it to die at sea. The international community must answer this call. This includes establishing domestic sanctuaries where they do not yet exist, regulating international trade and banning all fishing of threatened and endangered shark species lacking management plans. Finally, as the year ended, Congress passed the Shark Conservation Act. The measure-signed this January by President Obama-will boost efforts to conserve sharks and help stop wasteful finning. But, no matter how bold, the actions of any one country alone will not be enough to save threatened species worldwide. The clock is ticking for sharks everywhere, yet it's not too late to save these amazing marine predators from extinction. Matt Rand directs the Pew Environment Group's Global Shark Conservation Campaign. 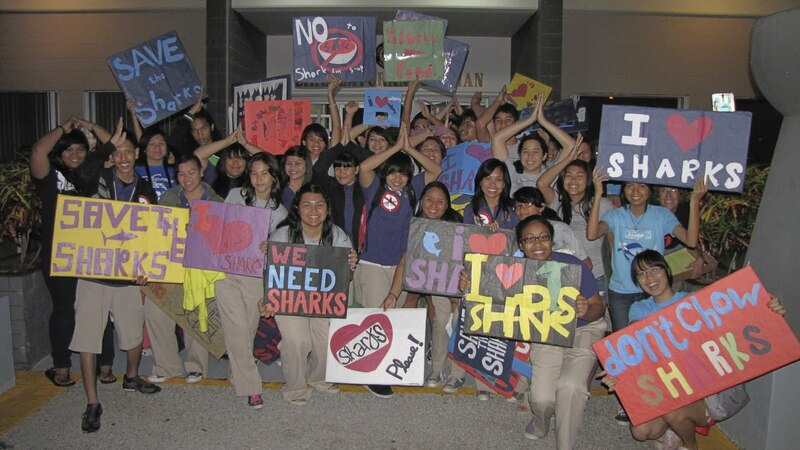 Young Shark Defenders: Students from Simon Sanchez High School and George Washington High School in front of the Guam Senate after last week's public hearing. Guam's public school students are raising environmental awareness about the protection of land and marine resources. Simon Sanchez High School's Making a Difference in the Environment Club, or MADE, recently hosted filmmaker Rob Stewart at the school. Stewart spent four years visiting 15 countries to film sharks and expose the illegal and often dangerous world of shark finning. Stewart talked about the importance of shark conservation, halting the massacre of sharks for their fins, and other environmental issues that affect marine life. A bill recently introduced on Guam by Vice Speaker Benjamin J. F. Cruz and Sen. Rory Respicio aims to prohibit the trading and selling of shark fins and ray parts. According to Cruz, each year, commercial fishing kills more than 100 million sharks worldwide -- including tens of millions for just their fins. "Sharks and rays are especially vulnerable to overfishing because they are slow growing and have few young. Shark finning is brutal and wasteful fishing because less than 5 percent of the weight of the shark is removed with the rest dumped overboard to bleed to death," he stated in a press release. Evelyn Quiel, MADE president, said it was an honor to host Stewart, whose visit trailed at the heels of the introduction of the local legislation. Students were able to learn more about Stewart's efforts to save the environment. "I think students are inspired when they see what other people are doing to make a difference," Quiel said. "I'm hoping it will help us, the students on Guam, to want to do more and inspire others as well." The group, along with other student environmental organizations on Guam, has become a large part of the island community's efforts to promote an awareness of the impact people have on the environment. Among those organizations is Marine Mania, a George Washington High School student organization that has its roots in marine biology teacher Linda Tatreau's classroom. The GW and Simon Sanchez clubs have helped plant trees, promoted awareness about shark finning, and picked up trash around the island. At schools, they recycle and hold events that teach fellow students why it's important that they make a stand in protecting the environment. 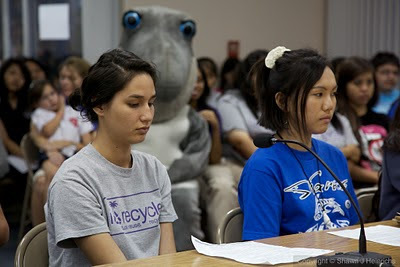 MADE adviser and Simon Sanchez High marine biology teacher Melanie Blas said today's high school students are a part of a generation where eco-consciousness has become the forefront of discussion. By participating in these events, student or community groups that are involved in environmental programs can help do more than pick up trash and recycle. "Because they're out there, they can see the problems, the challenges in programs like recycling and maybe they'll be able to come up with a solution in the future that makes being environmentally responsible more economically or financially feasible or even beneficial," Blas said. "I would encourage students to participate in a program, whether it's at the school level or the community level." The University of Guam Green Army is one example of an environmental awareness program at the community level. The organization has attracted students from both the high school and college level. Saipan, Northern Mariana Islands – Before he was the Speaker of the House and Lietenant Governor, Diego T. Benavente was a fisherman. Today Benavente is the minority leader in the Northern Mariana Islands House of Representatives, and is making a name for himself for his conservation efforts. Benavente believes the disappearance of fish is partly due to a severe decline in global shark populations. The issue was first brought to his attention by a fellow fisherman and confirmed by State Senator Clayton Hee of Hawaii as well as global shark conservation groups such as WildAid and Shark Savers. 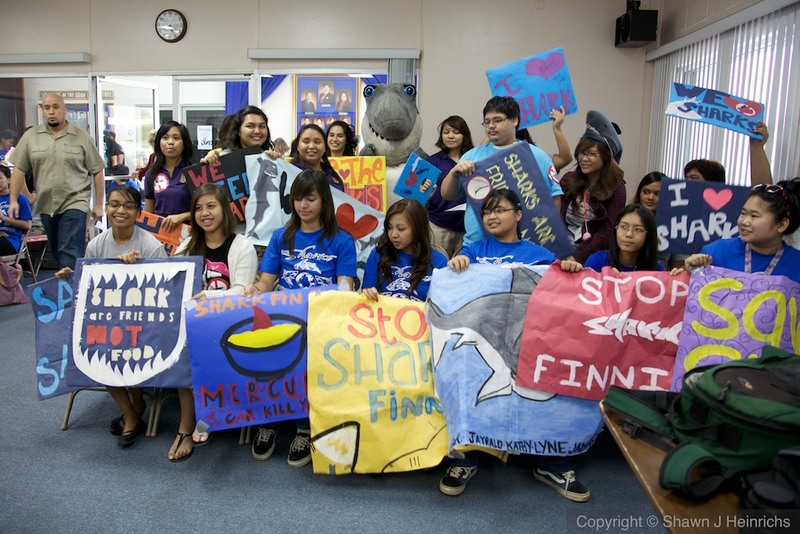 Benavente is now championing shark conservation efforts in the Northern Mariana Islands and introduced the Shark Fin Prohibition Act last year, which prohibits the sale, possession, and distribution of shark fins. Governor Benigno R. Fitial signed the bill into law on January 27, 2011. 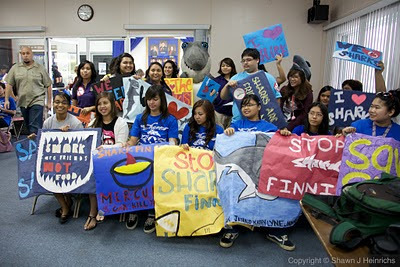 The shark fin ban is only the second of its kind and is modeled after a similar shark ban implemented in Hawaii in 2010. Rob Stewart, producer and director of Sharkwater, was on Saipan to film the signing of the legislation as part of an upcoming documentary. According to Stewart, sharks are targeted globally for their fins, which are used as an ingredient in shark fin soup, an Asian delicacy. He says that 73 million sharks per year are killed to supply the global shark fin trade. Benavente would like to see more governments, from national legislatures to local municipal councils, tackle the issue of shark finning and has made a challenge to governments across the world. “A global moratorium on the sale of shark fins is a good place for all of us to start,” he says.